"Carson City" redirects here. For other uses, see Carson City (disambiguation). Carson City is an independent city in and the capital of the US state of Nevada, named after the mountain man Kit Carson. As of the 2010 census, the population was 55,274. The majority of the town's population lives in Eagle Valley, on the eastern edge of the Carson Range, a branch of the Sierra Nevada, about 30 miles (50 km) south of Reno. 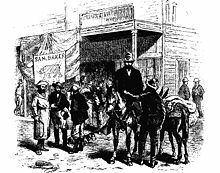 The town began as a stopover for California-bound emigrants, but developed into a city with the Comstock Lode, a silver strike in the mountains to the northeast. The city has served as Nevada's capital since statehood in 1864; for much of its history it was a hub for the Virginia and Truckee Railroad, although the tracks were removed in 1950. Before 1969, Carson City was the county seat of Ormsby County. 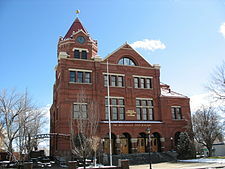 The county was abolished that year, and its territory merged with Carson City to form the Consolidated Municipality of Carson City. With the consolidation, the city limits extend west across the Sierra Nevada to the California state line in the middle of Lake Tahoe. Like other independent cities in the United States, it is treated as a county-equivalent for census purposes. The Washoe people have inhabited the valley and surrounding areas for about 6,000 years. The first European Americans to arrive in what is now known as Eagle Valley were John C. Frémont and his exploration party in January 1843. Fremont named the river flowing through the valley Carson River in honor of Kit Carson, the mountain man and scout he had hired for his expedition. Later, settlers named the area Washoe in reference to the indigenous people. By 1851 the Eagle Station ranch along the Carson River was a trading post and stopover for travelers on the California Trail's Carson Branch which ran through Eagle Valley. The valley and trading post received their name from a bald eagle that was hunted and killed by one of the early settlers and was featured on a wall inside the post. As the area was part of the Utah Territory, it was governed from Salt Lake City, where the territorial government was headquartered. Early settlers bristled at the control by Mormon-influenced officials and desired the creation of the Nevada territory. A vigilante group of influential settlers, headed by Abraham Curry, sought a site for a capital city for the envisioned territory. In 1858, Abraham Curry bought Eagle Station and thereafter renamed the settlement Carson City. [not in citation given (See discussion.)] As Curry and several other partners had Eagle Valley surveyed for development. Curry decided Carson City would someday serve as the capital city and left a 10-acre (40,000 m2) plot in the center of town for a capitol building. After gold and silver were discovered in 1859 on nearby Comstock Lode, Carson City's population began to grow. Curry built the Warm Springs Hotel a mile to the east of the city center. 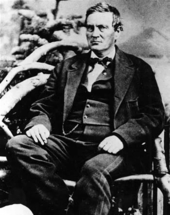 When territorial governor James W. Nye traveled to Nevada, he chose Carson City as the territorial capital, influenced by Carson City lawyer William Stewart, who escorted him from San Francisco to Nevada. As such, Carson City bested Virginia City and American Flat. 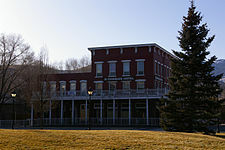 Curry loaned the Warm Springs Hotel to the territorial Legislature as a meeting hall. The Legislature named Carson City to be the seat of Ormsby County and selected the hotel as the territorial prison with Curry serving as its first warden. Today the property is still part of the state prison. 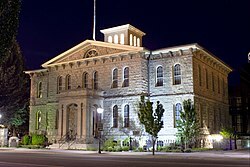 When Nevada became a state in 1864 during the American Civil War, Carson City was confirmed as Nevada's permanent capital. Carson City's development was no longer dependent on the mining industry and instead became a thriving commercial center. The Virginia and Truckee Railroad was built between Virginia City and Carson City. A log flume was also built from the Sierra Nevadas into Carson City. The current capitol building was constructed from 1870 to 1871. The United States Mint operated the Carson City Mint between the years 1870 and 1893, which struck gold and silver coins. People came from China during that time, many to work on the railroad. Some of them owned businesses and taught school. By 1880, almost a thousand Chinese people, "one for every five Caucasians", lived in Carson City. Carson City's population and transportation traffic decreased when the Central Pacific Railroad built a line through Donner Pass, too far to the north to benefit Carson City. The city was slightly revitalized with the mining booms in Tonopah and Goldfield. 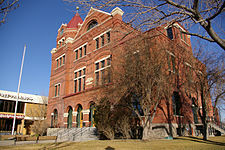 The US federal building (now renamed the Paul Laxalt Building) was completed in 1890 as was the Stewart Indian School. Even these developments could not prevent the city's population from dropping to just over 1,500 people by 1930. Carson City resigned itself to small city status, advertising itself as "America's smallest capital". The city slowly grew after World War II; by 1960 it had reached its 1880 boom-time population. As early as the late 1940s, discussions began about merging Ormsby County and Carson City. By this time, the county was little more than Carson City and a few hamlets to the west. However, the effort did not pay off until 1966, when a statewide referendum approved the merger. The required constitutional amendment was passed in 1968. On April 1, 1969, Ormsby County and Carson City officially merged as the Consolidated Municipality of Carson City. With this consolidation, Carson City absorbed former town sites such as Empire City, which had grown up in the 1860s as a milling center along the Carson River and current U.S. Route 50. Carson City could now advertise itself as one of America's largest state capitals with its 146 square miles (380 km2) of city limits. In 1991, the city adopted a downtown master plan, specifying no building within 500 feet (150 metres) of the capitol would surpass it in height. This plan effectively prohibited future high-rise development in the center of downtown. The Ormsby House is the tallest building in downtown Carson City, at a height of 117 feet (36 m). The structure was completed in 1972. Carson City features a semi-arid climate with cool but not inordinately cold winters and hot summers. The city is in a high desert river valley approximately 4,802 feet (1,464 m) above sea level. There are four fairly distinct seasons, all of which are relatively mild compared to many parts of the country and to what one may expect given its elevation. Winters see typically light to moderate snowfall, with a median of 8.9 inches (23 cm). Most precipitation occurs in winter and spring, with summer and fall being fairly dry, drier than neighboring California. There are 37 days of 90 °F (32 °C)+ highs annually, with 100 °F (38 °C)+ temperatures occurring in some years. The average temperature in Carson City increased by 4.1 °F (2.3 °C) between 1984 and 2014, a greater change than in any other city in the United States. The Carson River flows from Douglas County through the southwestern edge of Carson City. Foreman-Roberts House Museum – Gothic Revival architecture, tours available. Yesterday's Flyers, an aviation museum in Carson City. Prison Hill – California Trail historic markers, location of the Stewart "S"
Carson City is the smallest of the United States' 366 metropolitan statistical areas. As of the 2010 census, there are 55,274 people, 20,171 households, and 13,252 families residing in the city. The population density is 366 people per square mile (141/km2). There are 21,283 housing units at an average density of 148/sq mi (57/km2). The racial makeup of the city is 81.1% White, 1.9% Black or African American, 2.4% Native American, 2.1% Asian, 0.2% Pacific Islander, 9.4% from other races, and 2.9% from two or more races. 21% of the population are Hispanic or Latino of any race. As of the 2000 census, there are 20,171 households, out of which 29.8% have children under the age of 18 living with them, 50.0% are married couples living together, 11.0% have a female householder with no husband present, and 34.3% are non-families. 27.8% of all households are made up of individuals and 11.00% have someone living alone who is 65 years of age or older. The average household size is 2.44 and the average family size is 2.97. The city's age distribution is: 23.4% under the age of 18, 7.9% from 18 to 24, 28.9% from 25 to 44, 24.9% from 45 to 64, and 14.9% who are 65 years of age or older. The median age is 39 years. For every 100 females, there are 106.90 males. For every 100 females age 18 and over, there are 108.20 males. Data from the 2000 census indicates the median income for a household in the city is $41,809, and the median income for a family is $49,570. Males have a median income of $35,296 versus $27,418 for females. The per capita income for the city is $20,943. 10.0% of the population and 6.9% of families are below the poverty line. Out of the total population, 13.7% of those under the age of 18 and 5.8% of those 65 and older are living below the poverty line. As of 2010, 82.31% (42,697) of Carson City residents age 5 and older spoke English at home as a first language, while 14.12% (7,325) spoke Spanish, 0.61% (318) French, and numerous Indo-Aryan languages were spoken as a main language by 0.50% (261) of the population over the age of five. In total, 17.69% (9,174) of Carson City's population age 5 and older spoke a first language other than English. 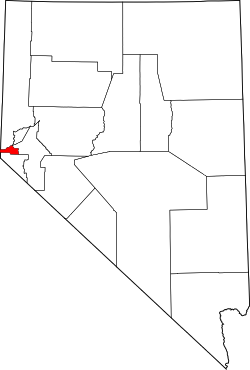 Ormsby County consolidated with Carson City in 1969, and the county simultaneously dissolved. The city is now governed by a five-member board of supervisors, consisting of a mayor and four supervisors. All members are elected at-large, but each of the four supervisors must reside in respective wards, numbered 1 through 4. The mayor and supervisors serve four year terms. Elections are staggered so the mayor and the supervisors from Wards 2 and Ward 4 are elected in presidential election years, and the supervisors from Ward 1 and 3 are elected in the even-numbered years in between (i.e., the same year as gubernatorial elections). Nevada's capital is generally considered a Republican stronghold, often voting for Republicans by wide margins. In 2004, George Bush defeated John Kerry 57-40%. In 2008, however, Barack Obama became the first Democrat since 1964 to win Ormsby County/Carson City, defeating John McCain 49% to 48%, by 204 votes, a margin of under 1%. Carson City, being the state capital, is home to many political protests and demonstrations at any given time. In an attempt to either make proposed spent nuclear fuel storage facility at Yucca Mountain prohibitively expensive (by raising property tax rates to the maximum allowed) or to allow the state to collect the potential federal payments of property taxes on the facility, the state government in 1987 carved Yucca Mountain out of Nye County and created a new county with no residents out of the area surrounding Yucca called Bullfrog County. Carson City became the county seat of Bullfrog County, even though it is not in Bullfrog County and is more than 100 miles (160 km) from Yucca Mountain. A state judge found the process unconstitutional in 1989, and Bullfrog County's territory was retroceded to Nye County. Carson City has never hosted any professional team sports. However, a variety of sports are offered at parks and recreation. Many neighborhood parks offers a wide variety of features, including picnic tables, beaches, restrooms, fishing, softball, basketball hoops, pond, tennis, and volleyball. The largest park is Mills Park, which has a total land area of 51 acres (0.21 km2) and includes the 2 ft (610 mm) narrow-gauge Carson & Mills Park Railroad. While there are no ski slopes within Carson City, the city is near the Heavenly Mountain Resort, Diamond Peak and Mount Rose Ski Tahoe skiing areas. Carson City has served as one of the state’s centers for politics and business. Every state governor since Denver S. Dickerson has resided in the Governor's Mansion in Carson City. See also: List of Governors of Nevada. The following personalities took up a residence in Carson City at some point in their lives. There are four highways in the city: Nevada State Route 28, U.S. Route 395, U.S. Route 50, and Interstate 580, its only freeway. Phase 1 of the Carson City Freeway Project from US 395, just north of the city, to US 50 was completed in February 2006 and Phase 2A, extending from Rt. 50 to Fairview Drive, was officially opened on September 24, 2009. Phase 2B, Fairview Drive to Rt. 50, was completed in August 2017. Prior to 2012, Carson City was one of only five state capitals not directly served by an Interstate highway; the city lost this distinction when I-580 was extended into the city limits. Carson City's first modern bus system, Jump Around Carson, or JAC, opened to the public in October 2005. JAC uses a smaller urban bus ideal for Carson City. However, there is virtually no ground public transportation to other destinations. Passenger trains haven't served Carson City since 1950, when the Virginia and Truckee Railroad was shut down. Greyhound Lines stopped their bus services to the town in 2006 and Amtrak discontinued their connecting thruway bus to Sacramento, California in 2008. There is now only a limited Monday – Friday RTC bus service to Reno which is still served by both Greyhound and Amtrak. Carson City is also served by the Carson Airport, which is a regional airport in the northern part of the city. Reno–Tahoe International Airport, which is 28 miles (45 km) away, handles domestic commercial flights. The Carson City School District operates ten schools in Carson City. The six elementary schools are Bordewich-Bray Elementary School, Empire Elementary School, Fremont Elementary School, Fritsch Elementary School, Mark Twain Elementary School, and Al Seeliger Elementary School. The two middle schools are Carson Middle School and Eagle Valley Middle School. Carson High School and the alternative Pioneer High School serve high school students. Carson High is on Saliman Road. Western Nevada College (WNC) is a regionally accredited, two-year and four-year institution which is part of the Nevada System of Higher Education. The college offers many programs including education, arts and science. ^ a b "State & County QuickFacts". United States Census Bureau. Archived from the original on September 19, 2013. Retrieved September 23, 2013. ^ a b "About Carson City". Carson City. May 29, 2006. Retrieved November 20, 2011. ^ "National Park Service: Three Historic Cities". Travel Nevada.com. Retrieved June 2, 2010. ^ Bayer, C.W. (1995). Profits, plots & lynching; the creation of Nevada Territory. Carson, City NV: Purple Mountain Press. p. 2. ISBN 0-9628890-3-2. ^ Oldham, Willa (1991). Carson City: Nevada’s Capital City. Carson City, NV: Nevada State Museum. p. 5. ASIN B0006QSL8Q. ^ Carson City website. "Carson City Living History". Retrieved January 17, 2013. ^ Hauck, Eldon (1991). American Capitols. Jefferson, NC: McFarland & Company, Inc. p. 138. ^ Kelli Du Fresne. "Dedicated to Carson's Chinese history". Nevada Appeal. Archived from the original on April 7, 2012. Retrieved September 7, 2011. ^ Carson City Government. "Carson City: History". Retrieved February 6, 2010. ^ Staff Writer. "About Carson City". Emporis. Archived from the original on October 23, 2012. Retrieved February 6, 2010. ^ "Carson City High Rise Buildings". Emporis.com. Retrieved January 17, 2013. ^ "Carson City: Geography and Climate". www.city-data.com. Retrieved December 25, 2017. ^ a b c "NowData - NOAA Online Weather Data". National Oceanic and Atmospheric Administration. Retrieved June 25, 2013. ^ Chereb, Sandra (June 4, 2014). "Carson City leads nation in warming trend". The Associated Press. Archived from the original on July 14, 2014. Retrieved October 7, 2017. ^ "Stewart Indian School-Three Historic Nevada Cities: Carson City, Reno and Virginia City-A National Register of Historic Places Travel Itinerary". Nps.gov. Retrieved January 17, 2013. ^ "The Historic James Doane Roberts House". Cchistorical.org. Archived from the original on August 28, 2013. Retrieved 2013-01-17. ^ "Yesterday's Flyers:". Retrieved April 19, 2012. ^ "U.S. Decennial Census". United States Census Bureau. Archived from the original on April 22, 2013. Retrieved December 20, 2014. ^ "Historical Census Browser". University of Virginia Library. Retrieved December 20, 2014. ^ "Population of Counties by Decennial Census: 1900 to 1990". United States Census Bureau. Retrieved December 20, 2014. ^ "Census 2000 PHC-T-4. Ranking Tables for Counties: 1990 and 2000" (PDF). United States Census Bureau. Retrieved December 20, 2014. ^ Staff Writer. "Carson City Demographics". City-Data.com. Retrieved June 3, 2010. ^ "Carson City (city) County, Nevada". Modern Language Association. Archived from the original on August 15, 2013. Retrieved August 10, 2013. ^ a b c d Board of Supervisors, Carson City. ^ "Carson City Politics". carson.org. p. 95. Retrieved January 17, 2013. ^ Leip, David. "Dave Leip's Atlas of U.S. Presidential Elections". uselectionatlas.org. Retrieved December 25, 2017. ^ Terri Russell, Advocates Protest Horse Slaughter, KOLO News (January 5, 2013). ^ "World War II, Korea veterans join anti-war protests in Carson City". Las Vegas Review Journal. ^ Chereb, Sandra (March 21, 2011). "Protestors in Carson City Objecting to Education Cuts". Las Vegas Review Journal. Stephens Media. Associated Press. Retrieved January 13, 2015. ^ Staff Writer (May 14, 2010). "Carson City Recreation". Carson City. Retrieved March 6, 2010. ^ "Carson City & Mills Park RR No. 3". Retrieved December 25, 2017. ^ Staff Writer. "Parks in Carson City". Carson City. Archived from the original on July 16, 2011. Retrieved March 6, 2010. ^ Staff Writer. "Ski resort near Carson City". Google. Retrieved March 6, 2010. ^ Ballew, Susan J.; Dolan, L. Trent (2010). Early Carson City. Arcadia Publishing. p. 60. ISBN 978-0-7385-7158-4. Retrieved November 20, 2010. ^ "Historic Personalities". Visitcarsoncity.com. Archived from the original on January 16, 2013. Retrieved 2013-01-17. ^ "Duane Leroy Bliss". Carson City Convention & Visitors Bureau. Archived from the original on September 21, 2013. Retrieved September 19, 2013. ^ "Orion Clemens". nps.gov. Retrieved September 19, 2013. ^ "CRADLEBAUGH, John - Biographical Information". bioguide.congress.gov. Retrieved December 25, 2017. ^ "Abraham Curry". Carson City Convention & Visitors Bureau. Archived from the original on September 21, 2013. Retrieved 19 September 2013. ^ "Dat-So-La-Lee". californiabaskets.com. Retrieved September 19, 2013. ^ "Nellie Verrill Mighels Davis". .unr.edu. Retrieved September 19, 2013. ^ Pardington, Suzanne (July 15, 2009). "Fantasy writer David Eddings leaves Reed College $18 million". The Oregonian. Retrieved August 25, 2014. ^ "George Washington Gale Ferris, Jr". Carson City Convention & Visitors Bureau. Archived from the original on February 4, 2013. Retrieved September 19, 2013. ^ "Ellen Hopkins". Simon & Schuster. Retrieved August 25, 2014. ^ Moreno, Richard (2011). A short history of Carson City. Reno: University of Nevada Press. pp. 128–129. ISBN 978-0874178364. Retrieved September 11, 2015. ^ Wallack, Roy. "Once shunned, Greg LeMond returns to biking world and road to success". latimes.com. Retrieved January 20, 2017. ^ "Greg LeMond's five greatest wins - Cycling Weekly". Cycling Weekly. April 20, 2015. Retrieved January 20, 2017. ^ "David Lundquist". BASEBALL REFERENCE. COM. Retrieved September 23, 2013. ^ "Maurice McLoughlin". International Tennis Hall of Fame. Archived from the original on September 20, 2013. Retrieved August 25, 2013. ^ "Hank Monk". Carson City Convention & Visitors Bureau. Archived from the original on January 31, 2013. Retrieved 23 September 2013. ^ Schrantz, Scott (May 6, 2006). "The Two Houses of Ormsby Then and Now". Aroundcarson.com. Retrieved December 28, 2013. ^ "Donovan Osborne". BASEBALL REFERENCE. COM. Retrieved September 23, 2013. ^ "Darrell Rasner". BASEBALL REFERENCE. COM. Retrieved September 23, 2013. ^ "Mark Twain (Samuel Clemens) – Carson City". Visitcarsoncity.com. Archived from the original on February 4, 2013. Retrieved 2013-01-17. ^ "Matt Williams". BASEBALL REFERENCE. COM. Retrieved September 23, 2013. ^ "Sarah Winnemucca may get her day in Nevada". Las Vegas Review-Journal. April 11, 2017. Retrieved March 31, 2018. ^ "Nevada Workforce". Archived from the original on March 16, 2012. Retrieved 2013-01-17. ^ "About JAC – Carson City". carson.org. Retrieved December 25, 2017. ^ Staff Writer. "Jump Around Carson". Jump Around Carson. Retrieved January 17, 2013. ^ "RTC Public Transportation". Retrieved December 28, 2013. ^ Staff Writer. "Carson City Airport". Carson City Airport. Archived from the original on June 14, 2010. Retrieved March 6, 2010. ^ Staff Writer. "Carson City School District". Carson City School District. Archived from the original on March 5, 2010. Retrieved March 6, 2010. ^ Staff Writer. "Western Nevada College Website". Western Nevada College. Retrieved June 3, 2010. Wikisource has the text of the 1911 Encyclopædia Britannica article Carson City. "Carson City". C-SPAN Cities Tour. August 2013.